Join the discussion on our forums! Come discuss Tar Lord over in our dedicated Tar Lord discussion topic. If your opponent let's it live and you need a finisher you can always combo it with Crazed Alchemist. Same applies to the opponent as well, switch it to 5 health for better trading value. Why is everyone calling tar taunts terrible? They're cheap and you can drop your glass cannons behind them, or complete the warrior quest and do the damage yourself. They may not be able to threaten face, but tar taunts stop aggro decks in their tracks. Don't understand all the hate. It's like Ancient of War turned up to 11. E.T.C approves. The Black Knight: "Delicous, with a hint of dinosaur bone." 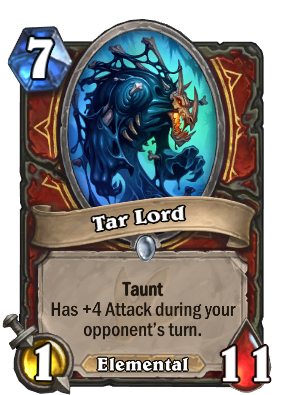 You might know this card by a different name...Tar Lord! Tar Lord, man. Common Warrior Minion. I can't believe they actually referenced that in the flavor text lmao! Fits the new Warrior archetype, camping behind big Taunts and grind out your Enemy with that Ragnaros. Still extremely weak, you can´t even kill nasty 2 drops which cockblock your random 8. So would this be better if it was only plus 3 attack to protect from death? Guardians of Un'Galaxy looks good.